Music Helps Physicians Heal Themselves When they aren't seeing patients, many doctors moonlight as musicians. Doctors' orchestras exist in a handful of cities around the country. Many doctors say these groups help them unwind. Some think it makes them better physicians, too. Joel Rose of member station WHYY reports. Albert Einstein was an avid violinist. So it's only appropriate that the medical school in the Bronx that bears his name should have its own amateur symphony orchestra. 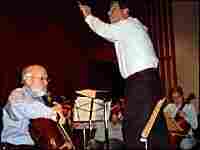 The Albert Einstein Symphony Orchestra has been giving concerts at Yeshiva University's Albert Einstein College of Medicine since 1982. Not all of the 45 or so musicians are doctors. 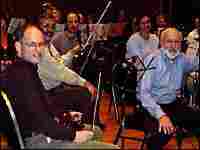 But many of them are, including the orchestra's founder and conductor, Dr. Stephen Moshman, an internist. As Joel Rose of member station WHYY reports, doctors' orchestras exist in a handful of cities around the country. Some doctors say these groups help them unwind from their tense careers. "Medicine is a stressful profession. Music is a wonderful release," Moshman says. Stephen Moshman's brother, Eliot, is also an internist and plays the French horn in the orchestra. Eliot Moshman says playing music has helped him appreciate what he calls the art of medicine. Learning to communicate with dozens of other musicians as an orchestra helps him when it comes to the one-on-one interaction with his patients. "It's a question of communication skills with patients, with other doctors," Eliot Moshman says. "There are a lot of ways to make people feel better, other than giving a cut-and-dried answer and writing a prescription. That's would I would call the art of medicine, and it's not fluff."